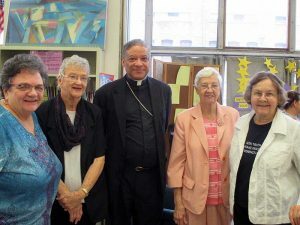 On Thursday, October 6, 2016, Bishop Joseph N. Perry of the Archdiocese of Chicago offered a simple blessing to learners and tutors at Aquinas Literacy Center (ALC) in honor of its 20th anniversary. ALC was founded in 1996 by the Adrian Dominican Sisters in response to the need for immigrants on Chicago’s southwest side to learn English. ALC continues to offer free, individualized tutoring in the English language to adult immigrants. Executive Director Alison Altmeyer welcomed everyone who attended and gave a brief history of the organization. Volunteer tutor and Adrian Dominican Sister, Pat McKee, OP, also read a biblical passage as part of the blessing. 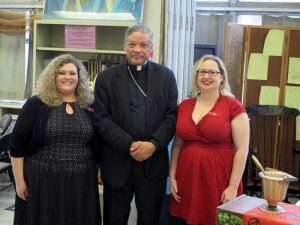 From Bishop Perry’s blessing, learners were encouraged to “enjoy their learning and take delight in new discoveries.” Learners were also advised to persevere in their study of the English language. Tutors were asked to “share their knowledge with gentle patience” and to engage the “eager minds” of their students. 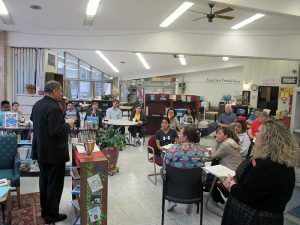 After the blessing, there was a reception with learners, tutors, friends of the Center, members of the Board of Directors, and staff.